I bought these beautiful craft papers a short time ago, and knew that I’d definitely be using the Hare papers to make a particular Birthday card – and, I did, and … this is it. Actually made in August, I saved the photos and couldn’t find where the darn I’d saved them … but a bit of a search (of around an hour long! tsk tsk) and I found them again today, so sharing a couple of photos here with you. The papers are made by Craft Consortium (I’ll add a link to their website at the bottom of this post for those who might be interested), and are truly beautiful papers. The images are so crisp and bright (although my photography skills are useless – forgive me), and the papers are a joy to work with. As you can see in the photo, I used four images from the same ‘Hare’ selection, which I matted and layered onto card-stock I already had. I used a little muslin square behind the main image, which I laid on top of some deep purple grosgrain ribbon. Some assorted stamens, in 3 colours of purples, are peeping out from behind the medium image. There are two tags, made from two smaller Hare images, which I tied with (hairy) string. And I finally added some paper flowers, which I finished with some buttons for the centres. Turning my attention to the inside of the card, I stamped an image of a Post Card, and gave it a vintage look with inks, then layered it onto some of the deep purple card which I’d also used on the front for matting and layering – so that the ‘theme’ was carried through into the inside of the card. I stamped a couple of images, which I then water-coloured. After the above photograph was taken I went back with the water-colours and painted a little more, and just brought the whole thing more ‘to life’. But … I then forgot to take another photo, so this sadly is the only one I have of the inside. This was a really enjoyable make, mainly I think, because I’m kind of in love with the beautiful papers. I have another of their collections, and can’t wait to make some cards with those too. Thank you so much for coming to share this card with me. It feels like FOREVER since I shared a card. I’ve been enjoying myself with the clay for far too long! (and I’m still hearing it calling to me! lol). I know that posts are a little infrequent at the moment, but this bloomin’ bout (or flare up) of ‘poorly’ is knocking the stuffing out of me, and I am so thankful to you for all your lovely messages of support, and am so genuinely grateful for your kindness and friendship. I’ve been thinking about …. (brace yourself) …. Christmas… and I’ve started to make my version of something I found on Pinterest, which I think you might like. I still have to finish the project though, so although I’m not quite ready to share it yet, I’m giving you a warning that Christmas is on its way! EEEeeek! lol. Again, thank you for coming. I love seeing you. Have a blessed day, my fabulous friends. Previous Little Cottages at the Harbour. Next Broom Pole Bird Houses. Christmas has arrived in your house too, eh? For people who craft / make / create, Christmas arrives a lot earlier than is decent, doesn’t it. lol. The flare up of ‘poorly’ seems to go one step forward and two steps back. It’s bloomin’ tiresome and fed-up making. But .. I’m sure that I’ll win eventually, because I’m a determined little madam. (My mom used to say that, anyway. lol). It’s so lovely to see you Soul G. Thank you so much for coming. Aww, bless you Anna. Thank you so much. Tickled pink that you like the card. Like you it’s the colours which call to my heart too. Thank you so much for coming Ruthie. It means the world to me to see you here. Oh Cobs, I love your hares. You are so artistically talented and I’m in awe of what you produce. Flare ups of whatever cause are a right pain (literally). I’m dealing with a back flare up and it’s caused … would you believe? … by singing!!! Apparently I have too much fun moving to the music when I’m at choir and it completely wrecks my back. I’m not sure whether to 😄 or 😪 but same as you … we will survive and endure because that’s what we do. Lovely to see you!. Aw heck, sorry to hear about the back problems you’re having. Singing??? Who’da thought?!!! Heck – I’m worried about you eating now, just in case you throw your back again! LOL – but perhaps I shouldn’t laugh as it might tempt fate! eeek! Thrilled to pieces that you like the Hare card. Not sure if I’m artistically talented or just lucky. …. hmm… I’ll go with luck as it seems more likely. lol. Thank you for your good wishes for sunshine, happiness and health. Those sound like the perfect combination. Thank you so much for coming Kay. Love seeing you here. I loved your comment on eating maybe throwing my back out and I had to be careful not to laugh too hard because at the moment it hurts to laugh … so I just did a big smile 😃 I also have to be careful when I sneeze when it’s this bad BUT what the heck, I’ve lived with this “back thing” for more than 40 years so I’m not going to let it stop me. I just have to remember to modify what I do and how I do it. Sometimes I forget and, as with soozyb2013, the OUCH can catch me any time. I looked up the “Spoon Theory” and it’s a brilliant explanation of living with chronic pain/illness/whatever. Thanks for mentioning it as I’d never heard about it before your post. Aw, I’m just thrilled to pieces that you saw that ‘Spoon Theory’ and went in search of what it’s about. Once you ‘get it’, it all makes perfect sense. I was chatting with a friend on the phone last night and asked if they had heard of the Spoon Story/Theory, and when the answer came back as ‘no’- I went on to explain it by saying … “Imagine that I’ve given you 12 spoons . . . ” and then made them walk through a typical day from the moment they woke up. They’d used up 7 spoons before they’d eventually got around to taking a shower and getting dressed! By lunchtime they only had one spoon left and I almost heard the penny drop when it dawned on them how the problems I’ve been living with for years had been affecting my whole life. Because I’m not a moaner, I know that I’d never managed to explain how difficult things were for me, and how bad they’d got. But this simple spoons story did the explaining for me in an amazing way. I love it, heart and soul. I’m now wondering if I should make a post about it to help get the story out there to people who may not have heard it. It might just help them either if they’re suffering with a Chronic illness, or if they have a friend or family member who has problems of that sort. Thank you so much for coming again, and for the lovely comment reply. Bless your incredibly beautiful heart. And thank you for coming back to me and also for the info on the Spoons. I explained the Spoons to my man today and for the first time in 50 years I think he is beginning to understand what my days are really like. He has his own back issues now but they’re recent, not long term like mine. Your idea to devote a post to Spoons is a good one and you should do it. There are so many people who deal with chronic pain/illness and even it it only helped one person to find a way to explain to those around them you will have done a wonderful thing. You reached me and I’ve reached my man and I will also be explaining to my family. Little ripples …..
My back is never going to be “normal” but nevertheless thank you for the kind thoughts and blessings. I faithfully promise Kay, that I’m going to dedicate a blog post to the Spoons story. It will appear in about two weeks time – which will give me enough chance to write it so that everyone will understand it. I’m totally THRILLED to pieces that you shared the Spoons with your husband. It’s such a wonderful way of helping someone to understand and see things in a totally different way. Likewise explaining it to your family. Little ripples… yes, very much so. Sending much love to you Kay. Have a fabulous Friday, and a truly terrific weekend. Yea you are back. Missed you and yes I know…I have been absent far to long too. Just can’t seem to get going in the land of blog. This is just grand and you are right..the papers are just about perfect and when you add your wonderful talent …well it just turns out super wonderful. I do hope and pray you are handling this situation you are dealing with…well of course you are..silly me. My prayers are for you.So many of my friends are in need of prayer ..I really could spend the whole day in deep thought. . But our God is good and things do work out. the storm could have been a lot worse and our friends came through well. New creations going to the new store…now if only some would sell. Aww you’re a sight for sore eyes! (as the saying goes). Absolutely fabulous to see you. I’m trying to work on handling the medical situation. I’ve been reminded today about a story I read about, oooh… must be about 18 months ago, and I came across the story on someone elses blog and it made me realise that I had to do the Spoon Theory for myself. (If you don’t know what that is, just let me know and I’ll explain further). So … from today I’m making sure that I try to spend my spoons in the best ways possible. I can understand how you feel you need to spend days in deep thought. There is so much going on (storm and such) and so much pain and distress because of the storm. Then there’s friends who are suffering with illness, and those who have to come to terms with loss – which you and I both know isn’t something that you can get a quick fix for. But please …. although you should remember them in your prayers – and I’m so proud of you that you do – you mustn’t become snowed under with distress about the problems that your friends and acquaintances are dealing with. Pray – but then leave the problems in Gods Hands. He knows how to deal with your prayers and thoughts, Bev. He’s well equipped to deal with ANYTHING you give Him. But once given, He wants you to trust Him and leave those requests in his capable hands. You MUST go about your life, knowing that you have done your best. Things will improve for everyone you pray for Bev. I was very worried about Rabbit of Rabbit Patch Diaries, and was so relieved to read a post from her telling everyone that all her people were safe. I almost cried with relief when I read it. As for your mind rambling … we can ramble together my lovely friend. I can ramble for an Olympic Medal …. sadly there is no category for Rambling. Sad. I know I'd have won. LOL. Will give the Cobs men hugs from you. 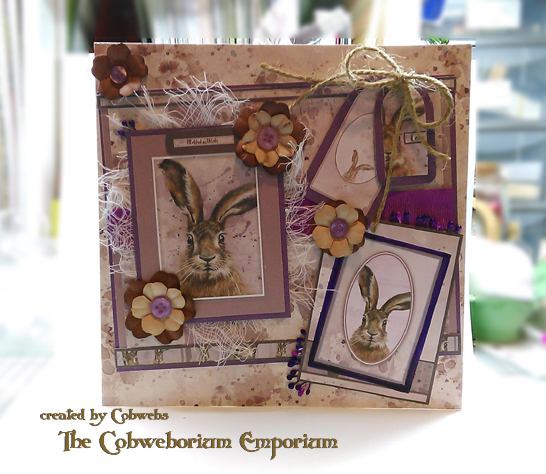 Beautiful card Cobs, love the hares. Too bad that you didn’t take photo of the inside after you painted. We have a lovely sunny day here today, it always makes you smile when you open your eyes and you can tell it’s going to be a good day. I wish our bodies would not start rallying against us in some cases, some days I forget that my shoulders can’t bend certain ways now and I go to grab something and ZING, ouch, darn it! I sometimes drop things and just have to watch the fall, cause if I go to catch them, surely I will hurt myself. I am in such denial. Thank you for sharing this wonderful card and the recipient will surely love it. Aw, tis lovely to see you. Glad you like the card, and yes, aren’t I a dope for finishing the watercolouring to the inside, and then forgetting to take an updated photo?!!! Aw, I mentally kicked myself when I realised. Flipping heck!! Your shoulder pain made me wince when I read how you can forget what you’re doing and instantly hurt your neck and shoulders through over-stretching or over-reaching. OUCH indeed! I’m so happy that you like the card Soozy, and thank you so much for coming and taking the time to stay for a chat. I love seeing you and chatting with you. Hope you are keeping well and that a gentle layer of ‘happy’ covers your days. I think the Fall sunshine is just so much better than summer. Not too hot but when it does touch your skin it’s healing rather than burning. My favourite times of year are the Fall and Spring. Thanks Cobs and hope you get sunshine. Same here Soozy – Autumn and Spring are my favourite times of year. A really real P.U.P.P.Y ???!!! Oh My Goodness!! A beautiful Boston too! Ohhh how fabulous Soozy. Aww, this is just delightful news. I love puppies. They come inbuilt with their own brand of squidges – and there’s nothing better than a puppy squidge, apart from a wagging puppy tail. Aw can’t wait to see a photo. You need to begin a blog, but one written by Hope (or whatever you end up actually calling her). Aw, I can just see it now: “The Journey of Hope” . . . and it would begin wherever you think it should – and have a photo of her doing whatever she happens to be doing at the time. Aww, that would be an incredible blog! And you’d gain followers – because everyone loves a puppy! I’m overjoyed for you Soozy. Totally. Thank you for your get well soon wishes – me is hoping that this current flare up will cease and desist asap. But . . . before I waddle off . . . I take my duty as friend very seriously, and because I lub you soooooo much, I know it is down to me to tell you the twufe of each and every situation we find ourselves in. So, with that knowledge I now have to inform you, as my contract states I do, that C-h-r-i-s-t-m-a-s is just . . . 96 days away. Does it involve a plane? Sooooooooooo my dearest Cobs do you really want me to tell you?? or can you wait 22 days?? [intake of breath …. then a round shouldered grumpy HUFF]. . . .
Party pooper. Yeah I wanted to know … but I’ll wait if you make me. I used to be like a cat on a hot tin roof … but then my beautiful little girls turned into teenagers and they took my roof off me. 😦 Apparently I was an embarrassment. aw, it’s fabulous to see you! Thrilled you like the card. It’s kind of friendly looking, isn’t it. An instant smile. Thank you so much for your good wishes. All very gratefully received, I can promise. Thank you so much for coming Tam, and for taking the time to chat. Love chatting with you. I am Christmas minded but my schedule has been so tight this month I havent been able to get anything done.. Hopefully I can over the next few weeks. We will see!!! -) Always happy to visit with you! =) xoxoxoxo my friend. Love seeing you Tam, and wish we lived closer to each other because I’d be your best customer. (or worst. lol). Thank you. Tickled pink that you like the card. Thank you so much for coming, and for the lovely message. I hope all is good with you too. Beautiful card Card. The images are so pretty. Hope all is well. Nooo, not thinking of Christmas. Maybe next week ha ha. Enjoy your clay. I can hear it calling to you Cobbbbbs, Cobbbbbs……. I’m not sure if I’m sending emails to the correct address Flo. I sent another one a few days or so ago. I think I might have the wrong address. Thank you so much for coming Flo. It’s truly lovely to see you. Aw Florence – moving house does that to a crafter. I didn’t properly craft for about 12+ months after we moved house nearly 7 years ago, so I know how it happens. I’ll drop you another email and see if it manages to get there. well you know I especially love these! Dear friend, I hope you are feeling well-I can not bear to think you aren;t. My God bless you. I hope every day is brighter than the last and that all the good you give this world comes back 10 fold! Ohhh, bless your beautiful heart, Rabbit. Aw thank you Mrs.Craft. I’m tickled pink that you like it. Well there you are Cobs, I have been missing you, and skimmed through my reader yesterday to make sure I hadn’t missed any of your posts. I’m sorry to hear about the “flare up”. What a jolly nuisance. Hares are one of the loves of my life, I think they look like miniature kangaroos sometimes, definitely the faces are very similar. I have some of the pictures from your gorgeous card on one of my Pinterest boards. I had the intention of trying a watercolour or two but no progress on that front so far. I too have already started thinking Christmas, the shops are showing signs as well I hear, though I haven’t ventured to the mall in a while. I found all the lovely cards I kept from last year and selected some to recycle (I may do a blog post about that). Although Christmas isn’t what it used to be when I was young, (lovely memories of family time), I still love some of the traditions and I do love making Christmas cards. Just a little side note, when I visit your blog, I always want to stay and check out everyone who makes a comment, some are old friends, and some new but your little community seem so genuine and lovely, I want to stop a while (bide a wee) and soak it up. Cobs I hope you feel better soon. Crafting certainly helps when things are not 100% and if the clay is calling, get back to it, lose yourself. Oooo I LOVE re-cycled craft treasures! Yes, do a blog post about what they looked like then, and what they look like when you’ve done your thing to them! You might inspire others to do the very same thing. You’re right, Christmas isn’t the same as when we were younger. The magic that we felt at *that* time doesn’t carry through terribly well to our older selves. But …. we do have a magic which is newer and deeper in understanding as we grow older, and acknowledge that Christmas doesn’t come in a box or a ribbon wrapped package, but instead it’s something which lives in our hearts all year round. Each time we think of a person that we haven’t seen for a while and realise how much we miss them. Or maybe it’s the showing of the 35th time of that movie on TV. The one they wheel out every Christmas, and never fails to make us smile. The magic we felt as children gives way to a more grown up magic. But, the magic is still there . . . but instead of it coming courtesy of Mum and Dad, we now have to supply it ourselves by the use of our senses and memories, – and by the amount of blessings we have. Ugh … tell me about it! Each week seems like half a day! Tickled you like the card Nancee. Thank you for coming. Love seeing you.